I mentioned last week that I had receive a treasure trove of Vera Wang Cosmetics to try, and I have been delighted with each and every item I received. 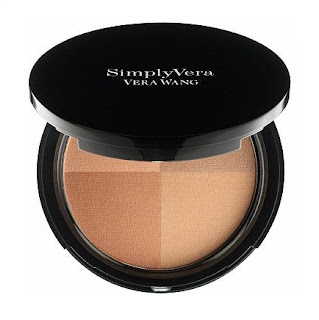 The Simply Vera Vera Wang Cosmetics Illuminating Pressed Powder ($32.50) is available in three shade quads. I would be #301, the lightest. I received the darkest, #303. It turned out to be a blessing because it a a stunning contouring and bronzing shade on my skin. Seriously stunning! I didn't really need another face powder, but I can always make room for a new bronzer. Vera Wang suggests you blend all four shades for illuminating color. You can do that. Or you can use the shades individually. The quads are large enough to do that. If you swirl these four expertly coordinated shades together, you'll create an allover naturally radiant and glowing complexion. No sparkle, just lively color. I wanted to show you the shades a few different ways. I applied all four shades mixed at the top of my arm, swatching heavily with a sponge-tipped applicator. The stripe below that is the peach shade alone - the one at the top left quadrant in the compact. I wanted to see how that would look as a blush. The large swatch at the bottom of my arm shows all four shades mixed again. It was applied with a dense blush brush. The powder in the compact is very powdery. Swirling a brush around loosened up the powder and left a little debris around the edges, but that soft quality makes it apply sheerly and perfectly for a finishing powder. There's no struggling to transfer the powder to a brush, shake, fluff, and go. Vera Wang Cosmetics Illuminating Pressed Powder offers amazing quality at a very reasonable (even inexpensive) prices. I'm delighted to have had the opportunity to test this beautiful makeup. With the taste I've had, I'm becoming a devotee quickly. Vera Wang can do no wrong. Kohl's is the exclusive source. I'm so glad I can order online. I can promise I'll be ordering at Kohl's when I see my next paycheck. I have a few more treasures to show you this week. Stay tuned. Thank you for the swatch, anxious to try the Vera Wang line. I have some Kohls cash to spend. That looks like a beautiful shade. I agree with you, I can always find room for another powder. Everything in this line is stunning! I have more to show. Lipsticks, highlighter...it's all amazing.